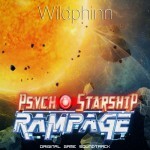 Psycho Starship Rampage is a tactical rogue-like that plays as a space shooter. Build your spaceship from scratch. Load it with weapons. And use your creation to destroy various enemies throughout numerous levels. Then loot their carcasses, upgrade your ship design, add more weapons and jump to the next sector for more action!